This Chocolate Chiffon Cake is so versatile. At its simplest just dust the top of the cake with cocoa powder or powdered sugar. To dress it up, you can pour a rich and glossy chocolate glaze over the top, letting it drip attractively down the sides of the cake. But at its most decadent you can turn it into a layer cake, by splitting it in half and filling it with a delicious mocha flavored whipped cream. Then pour the chocolate glaze over the top, only this time smooth the glaze over the entire sides of the cakes. 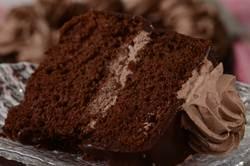 Finish it off with lovely swirls of the mocha whipped cream, and you have a beautiful and delicious party cake. At first glance you could mistakenly think this Chocolate Chiffon Cake was an Angel Food Cake. Both cakes are beautiful with their tall circular shape and that characteristic hole in the center which comes from baking the cake in a tube pan. But a Chiffon Cake is different in that they contain both egg yolks and egg whites, along with an artifical leavener (baking powder and baking soda), a liquid, and a liquid fat (in the form of oil). It is the oil that gives this cake its wonderful moist and tender crumb and keeps the cake soft even when refrigerated. For a little trivia. The chiffon cake was invented in the 1920s by a Californian named Henry Baker who sold his recipe to General Mills in the 1940s. The batter is baked in an ungreased tube pan which allows the batter to cling to the sides of the pan as it bakes. The tube in the center of the pan lets the hot air circulate so the heat can reach the center of the cake. The cake needs to be turned upside down immediately upon removing it from the oven as this keeps the cake from shrinking and losing its volume as it cools. Chocolate Chiffon Cake: Separate the eggs while they are still cold. Place the egg yolks in one bowl and the whites (along with the extra egg white) in another. Cover with plastic wrap and bring to room temperature (about 30 minutes). Preheat the oven to 325 degrees F (165 degrees C). You will need a 10 inch (25 cm) two piece ungreased tube pan. In a large bowl sift the flour with the cocoa powder, 3/4 cup (150 grams) granulated white sugar, baking powder, baking soda, and salt. In a separate bowl whisk together the egg yolks, oil, coffee (or water), and vanilla extract. Make a well in the center of the flour mixture and add the wet ingredients and whisk until smooth. Scrape down the sides of the bowl as needed. In a separate bowl, with the whisk attachment, beat the egg whites and cream of tartar (if using) until soft peaks form. Gradually beat in the remaining 3/4 cup (150 grams) of sugar and beat until almost stiff peaks form. With a large rubber spatula or wire whisk, gently fold the egg whites (in three additions) into the batter just until blended (being careful not to deflate the batter). Pour the batter into the ungreased tube pan and run a metal spatula or knife through the batter to get rid of any air pockets. Smooth the top and bake in the preheated oven for about 55 to 60 minutes, or until a wooden skewer inserted into the center of the cake comes out clean. (When lightly pressed, the cake will spring back). Immediately upon removing the cake from the oven invert (turn upside down) the pan and place on a flat bottom cup (turned upside down) so it is suspended over the counter. Let the cake cool completely (about 1 1/2 hours). To remove the cake from the pan, run a long metal spatula or knife around the inside of the tube pan and center core. Invert onto a greased wire rack or cake circle. With a sharp knife cut the cake in half horizontally. Place the bottom layer on your serving plate and spread with about 3/4 cup (180 ml) of the cream filling. Gently place the top layer on the filling. Next, pour the chocolate glaze over the top of the cake letting it flow down the sides. Then with a knife or spatula spread the glaze over the sides of the cake. Place the rest of the filling in a piping bag and pipe a decorative border around the top of the cake (I used a Ateco star tip Number 846). I like to refrigerate the cake overnight before serving (this allows time for the flavors to mingle). The cake can be covered and stored in the refrigerator for about 4 days. Chocolate Glaze: Melt the chocolate, butter, and corn syrup in a stainless steel bowl placed over a saucepan of simmering water. Remove from heat, stir in the liqueur, and let cool slightly. Mocha Filling: Place your mixing bowl and wire whisk in the freezer for about 15-30 minutes. Then place all the ingredients, minus the cream, in the bowl. Stir about 2 tablespoons of the cream into the mixture. Add the rest of the cold cream and beat just until stiff peaks form. Serves about 10 - 12.